Fall is for grilling. Plain and simple. Grilling at home, at a friends’, or at your favorite team’s tailgating events. 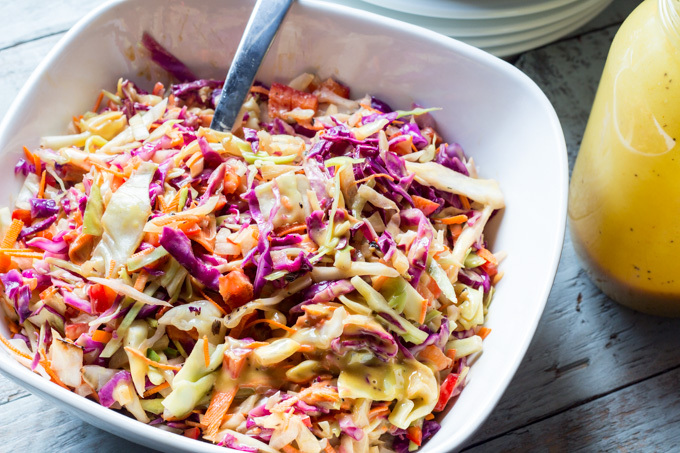 People often have slaw as a side during BBQ celebrations, but hardly ever is it focused on as the main squeeze. We’re about to change all of that. 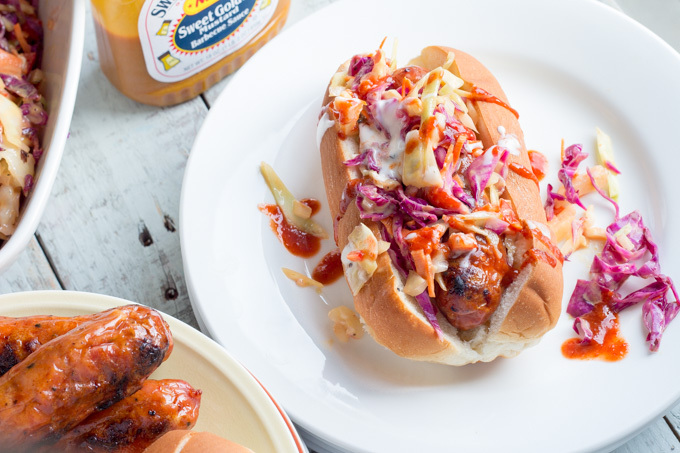 Grilled Mustard BBQ Slaw is the name of the winner’s game. We’ll grill the cabbage to give it a smoky, rich flavor and combine that with our favorite mustard-style BBQ sauce to make things a true touchdown. We’ve discussed already that grilling is basically a religion here in the South. If you are going to grill, you better make it worth your time and do it well. Light up the charcoals. If you want to up your grilling game, be sure to read to the end of the post for an opportunity to win a YEAR supply of Sweet Baby Ray’s BBQ sauce and a killer tailgating kit. While we’ve all grilled up the traditional burgers, chicken and steak, you may not think to jump on the coals for your sides. 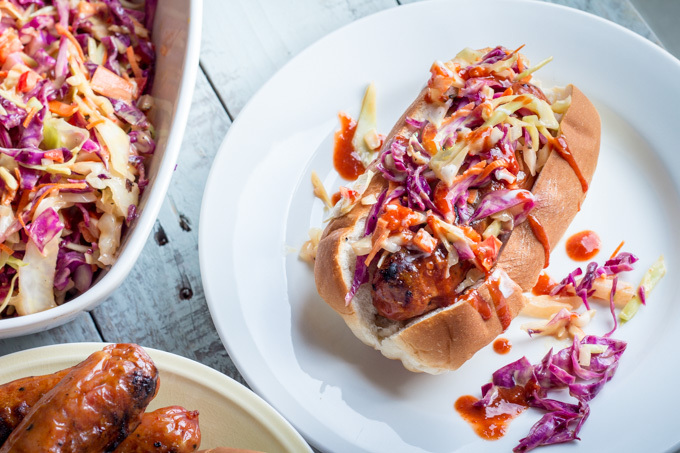 Grilled corn is a favorite of mine, but when I decided to make recipe perfect for tailgating, slaw was the first sidekick that came to mind. It’s simple to make, delicious on or with just about everything, and you can make it ahead of time if you want to just focus on the (drinking?) game later. 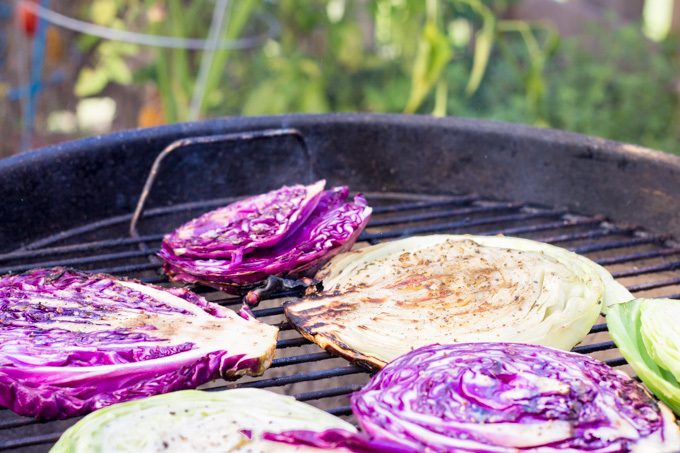 Grilling the cabbage is incredibly simple, but results in the most deep, smoky flavor. The bitterness from raw cabbage disappears, being replaced by a sweetened caramelization. You will probably not ever want to use cabbage for anything else without grilling it. In combination with the char-grilled cabbage, we’ll make a stellar sport-side sauce. Typically, a slaw sauce is made with mayo, vinegar and a few spices. Pretty simple. We’ll stick to the simple formula with a little bit of a mustard kick. Carolina BBQ style. Everyone knows Sweet Baby Ray’s. Everyone. Their sauce originated back in 1985, when a boy entered his family recipe into a rib competition and beat out over 7,000 other contenders. Fast forward 30 years, and here it is. Still the same solid award-winning recipe. While the original style SBR sauce hits home, they have just released a new variety that I am officially addicted to– Sweet Golden Mustard Barbecue Sauce. This mustard-based BBQ sauce is everything that my dreams are made of in a bottle. My standards for mustard sauce are pretty high. Each summer, my family spends a bit of time in South Carolina, where we go visit this one small roadside stop that has the best Carolina BBQ sauce ever. Until now. Sorry, M’s. This has you beat. 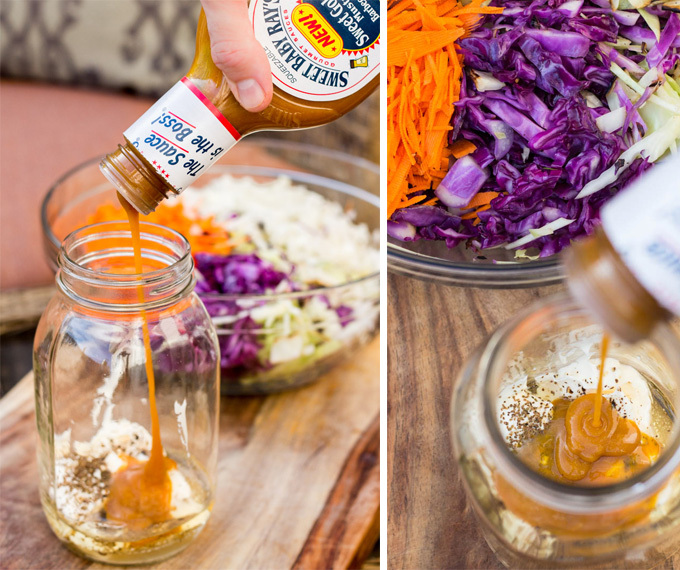 You can eat this sweet sauce slaw by itself or on your favorite BBQ bites. 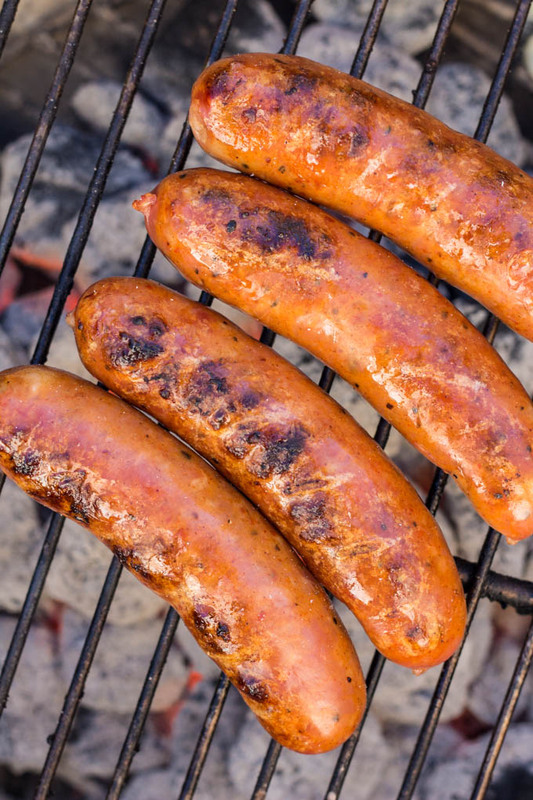 I can personally attest that it is delicious on hot dogs or brats, andouille, and burgers. It you’re feeling sporty, extend this side #BeyondTheBackyard to your favorite tailgate or party. Be sure to head over to Sweet Baby Ray’s site to enter to win a year supply of BBQ sauce and some Sweet Baby swag! A BBQ take on a classic side. 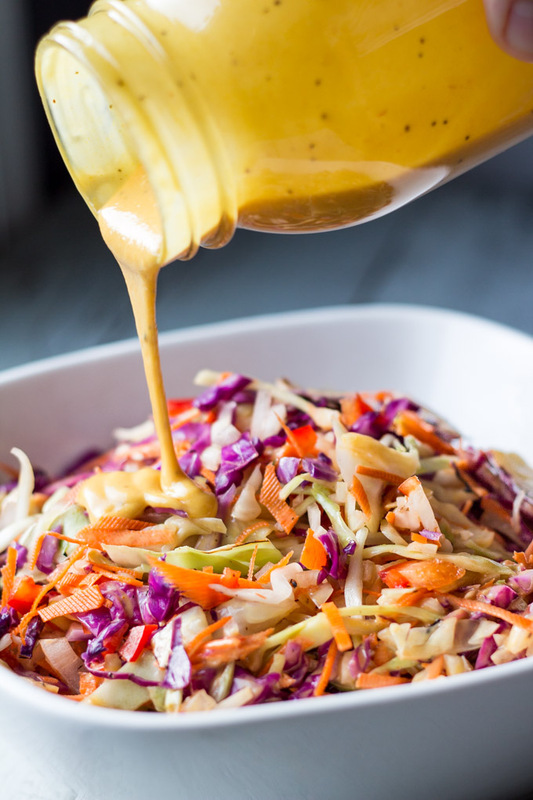 Grilled cabbage slaw with a sweet, creamy Carolina-style mustard BBQ sauce. From SouthernFATTY.com. Slice whole cabbage into 1-1½ inch large cuts. Set aside ½ of each, green and red cabbage. Lightly oil cabbage cuts. Salt and pepper generously. Grill on each side until thoroughly charred. Once cooled, slice thinly and combine with shredded carrots. Combine sauce ingredients in a bowl or jar and mix completely. Mix sauce with cabbage mixture. Serve immediately or store in refrigerator until needed. Disclosure: This post was sponsored by Sweet Baby Ray’s. All of the thoughts and statements are that of my own opinion without any influence from the partnership. Seriously. 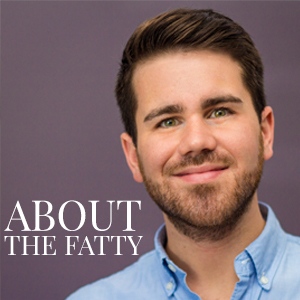 I love this stuff, and that’s why I partnered with them. I would have never thought to use BBQ sauce in slaw. You forgot to mention that when you grill in the South, you NEVER refer to it as “barbecuing”. This slaw looks delicious…I’ve never considered grilling the cabbage OR adding BBQ sauce to the dressing, but Ima hafta try this! I love me a good slaw on a dog!